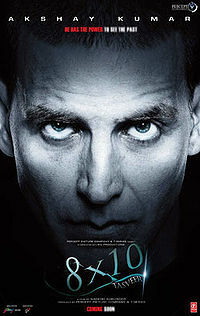 I’ve wanted to see Akshay Kumar in something other than a slapstick comedy for a while now. But, after watching 8×10 Tasveer, I’m ready for him to go back to slipping on banana peels. In 8×10 Tasveer, Kumar plays Jai, a Canadian forest ranger with psychic abilities. Specifically, Jai can look at a picture and mentally envision the events that transpired in the moments after the picture was taken. If there are multiple people featured in a photo, he can see the events from each of their perspectives. Early in the movie, Jai’s father dies in what appears to be an accident. But when a quirky detective (note to filmmakers: enough with the quirky detectives!) suggests that his father was murdered, Jai uses his psychic abilities to determine what really happened. The movie is slow but occasionally entertaining, as Jai delves into the mystery. But the truth behind Jai’s dad’s death is so cliched and soap operatic, I had to fight to keep from laughing during the protracted denouement. If you’re looking for a good supernatural thriller, skip 8×10 Tasveer and seek out Aa Dekhen Zara, instead. This entry was posted in Reviews and tagged 0.5 Stars, 2009, 8x10 Tasveer, Aa Dekhen Zara, Akshay Kumar, Bollywood, Hindi, Movie Review on April 3, 2009 by Kathy.